Want to talk to us about what makes our clients happy? Every company can say great things about itself. Review what our clients say instead. I attended David's CSM class and it was the best training class I have ever attended. David's Agile knowledge is impressive, he knows how to get you to thoroughly grasp the concepts by using real world examples and in class he challenges you by actively participating in a Scrum. We hired David to assist our product managers and business analysts with Scrum, specifically in the role of product owner. Our team had been given basic scrum training but no real training in the role of the product owner and the importance of it. David was an excellent agile trainer. He brought a wealth of agile experience and knowledge to our class. He shared a very good overview of the agile process, but then focused on the product owner role. He took our real world projects and assisted us in getting them into the scrum process, especially in the area of user stories. With David’s training our team now understands what their role is in the scrum process. They are also using tools and tips they received from David to assist them in their scrum teams. I recommend David as an agile instructor. Our company hired David for three days of Scrum/Agile training. Even before the training began, I knew we had chosen the right person for the job. I had numerous discussions with David in advance, so that he could tailor his training to our specific environment and needs. The training he provided was informative, fun, and kept everyone wanting more! David's passion and dedication to providing exceptional training were evident throughout every minute of the training, and we can definitely attribute our success in Agile to the training we received from him! My company hired David for a 3 day Agile training session. He is very friendly, intelligent and an exciting speaker. 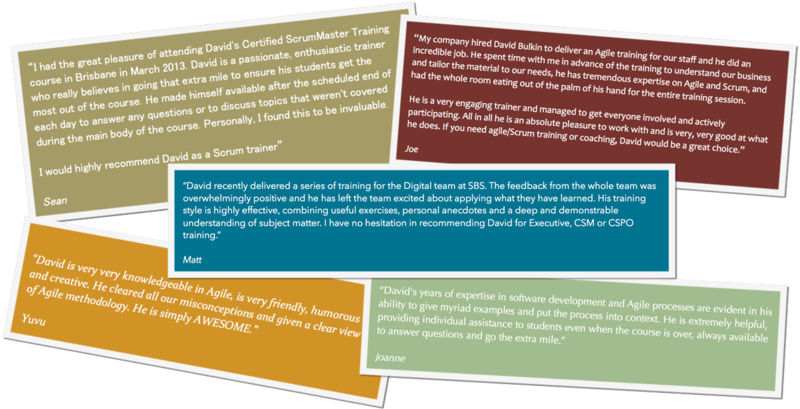 If you want no-nonsense, highly relevant Agile training then David is the right choice. He brings a fresh perspective and isn't afraid to point out the "intellectual hand waving" that is sometimes present with Agile development methodologies. I attended David's Certified Scrum Master course during March 2013. I found him to be a great presenter and trainer. He places great value on ensuring his students get the most out of the training course, even going so far as to stay back in his own time after the course to discuss the topics covered. The course was well structured and he provided real life examples to reinforce the training materials. I found this to be helpful and I intend to utilize the concepts learned during the course within my organization. I would recommend David as a trainer and to anyone interested in learning Scrum. I took CSPO Training with David in Herndon, VA and it was truly the most useful and best delivered training I’ve had to date! He did an amazing job customizing the content to make it light and yet extremely relevant to the nature of our work. Not only did I gain a much better understanding of the idea and purpose of Agile, but I now have a different view of my role on the scrum team and how my work can contribute to the overall vision of the organization. David is an expert at what he does. He knows how to engage the audience and make you think out of the box. The real life examples and jokes were priceless!